The copyright date on my hardcover copy of Henry David Thoerau’s Walden is 1950. I am sure it was my father’s — his handwriting so distinct, I can recognize it even in the precise, straight underlines of text he chose to highlight. We find common ground in these, though separated now by half a century and heaven. So many parallels of thought — and aspiration. So many ideas we found worth marking, as if his pen strokes and my echoed dog-eared folds somehow solidify and validate the original thought, and our bond. And so it is in this way that I have shared my days with Henry David and my father, also Henry, since July, when I first pulled the worn copy of Walden from my bookshelf. It has been no easy task, this reading of Walden. It does not meet the standards of 21st century timekeeping; there are no sound bites or “click here for more” appendages. You must slow your pace, rein in your thoughts, stretch your attention span until you can feel the heat of unused muscles. Perhaps that is why it has taken me close to three months to find my way to the last page of the book. “I must finish Walden,” I have said for weeks, as if it was some drudgery. But when I did finish, last night at nine, I could feel the longing well up in me at once, like saying goodbye to a dear friend after a long visit. I cannot tell you how many hours I have spent with Thoreau since July. Whether wandering his woods in pilgrimage, or carefully reading his faceted prose, or walking with him on my own path considering his grand effort. I do know that I have laughed with him, out loud; and marveled daily at the parallels of his world and ours; and shared his wisdom with friends; and sat with him in silence; and teared up at the beauty of his observations and reflections. Such is the reading of Walden. 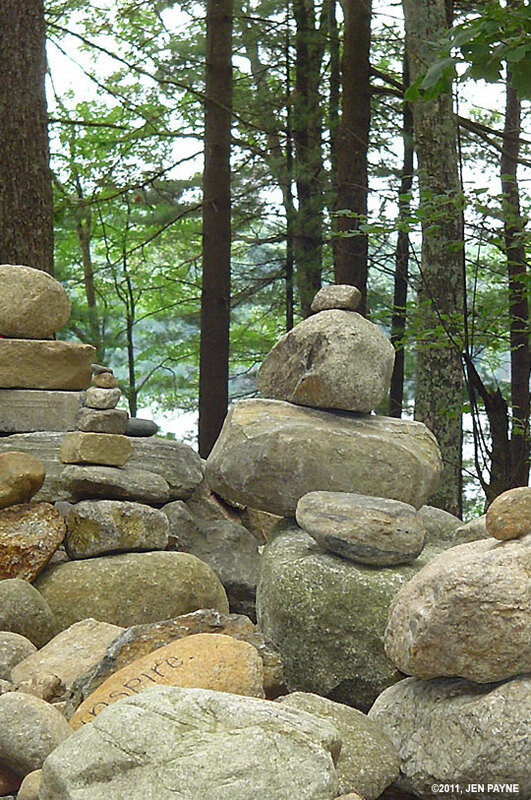 Photo ©2011 by Jen Payne, Walden Pond, July 2011. Thank you, Jen. I will return to read one a day.